The light is pretty bad, but the progress isn’t bad at all. I’m getting awfully close to finishing these singles! I’m a new spinner. I haven’t actively tried to spin yarn that thin. Slthough I have spun that thin, not by choice. I will say the longer I spin, the less yarn variations I have. This is a 4oz braid of Three Waters Farm’s Top of the Month Club (which I love). It’s called “Spring Spirit” and it’s dyed on Falkland. 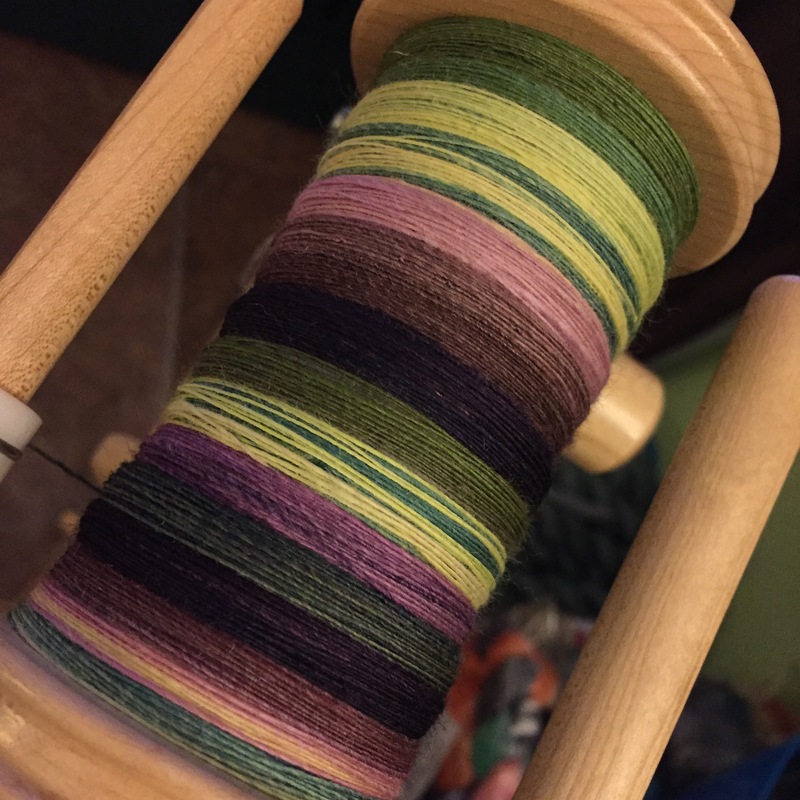 The club has two options — wool or wool+silk blends and I did the plain wool (which I loved) until March and now I’ve switched to the silk blends for the spring & summer. They really do a fantastic club — it’s a great way to try new fibers and the color are always gorgeous. As for how long it took me, it’s hard to say! I’m not a very fast spinner, but I also spin in fits & spurts whenever I have time and I don’t really pay attention to the hours I spend with a certain project. If I had to venture a guess, I’d say if I sat and worked on it without interruption it would take me anywhere between 2-4 days to spin the singles. Without interruption probably closer to 2, but I’m not positive because I’m never not interrupted. 🙂 It’ll probably take me another day to ply when I get that far, but I usually let things rest for a while before I do that. Lovely, how do you use/ply the singles? When you are spinning this weight singles how many yards do you generally get from 4oz? These singles I’m planning to navajo ply, so it’ll be a 3ply. Yardage will depend on how consistent my singles are and how much twist I put in when I’m plying. From this spin, I’ll guesstimate somewhere between 250-400yards (obviously I’m bad at guesstimating). More generally speaking, 4oz can yield wide range of yardage. Personally I rarely spin the same types of yarn in succession. I like to change up weights and methods. 4oz can easily yield a laceweight 2ply of 500+yards or less than 100yards of bulky or super bulky 2 or 3ply. Often my skeins are in the middle in the 275-450yard range in either 2 or 3 ply.